By Tom Cauble for UGG. 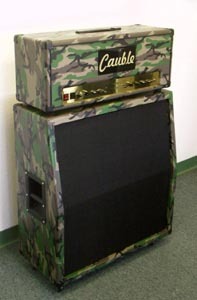 Here's a introduktion to the Cauble amps by the builder himself, Tom Cauble. The concept behind the Custom 100 was to create an amp versatile enough to get both classic rock sounds and high-gain sounds; I also wanted an amp with enough gain to eliminate the need for boost-type devices in the signal chain. This amp was designed such that, even with heavy distortion, chords maintain individual note clarity, and the guitar cleans up as guitar volume is turned down. Simplicity of operation is another goal realized in this amp. Our yellow-cadmium-plated steel chassis (the metal box that houses the electronics) are custom-made specifically for us. Using steel chassis has the effect of minimizing electromagnetic interference from external sources (including hum produced by the power transformer itself). Our head cabinets are built to last. They are made from 3/4" Birch ply; the interior is reinforced with 2x2 and 1x2 pine supports. The head cabinet is also shielded with solid ferromagnetic material to minimize electromagnetic interference from external sources, and reduce power transformer/pickup coupling noise. Our circuits are hand-wired on insulated 1/16" thick fiberglass epoxy boards utilizing turret-style construction methods. All tube sockets are chassis mounted. Our preamp tube sockets are ceramic; our power tube sockets are military-grade. We use teflon-insulated silver bearing wire for all circuits associated with signal. Groove Tubes are our tubes of choice. If you want something else, you may specify. Our amplifiers are constructed using Rohderstein and Vishay ultra-low-noise resistors throughout the signal chain. Among the capacitors found in our amps, you will find Solen fast capacitors, Orange Drop, Mallory, and F&T can capacitors. We use no ceramic capacitors in our amps. In short, I build them the way I would want it built for myself!